today i remembered – i do have something new in the works! i am finally working on the book i began several years ago – and one i have been asked about lately – like ‘requested’. ^_^ it will not be a book that is published by C&T, or anyone like that. could be – i’m just not choosing to do that. and it will be spiral bound – not because that might be ‘cheaper’ – but because i want folks to be able to open it and have it lie flat. it is to be used as a ‘teaching tool’ – with pictures for reference while you are stitching. i am doing my best to write it the same way i teach the beginning applique class – including all the many little tips i give during those full day classes! so, there are now 3 finished chapters – complete with ‘illustrations’. i will probably begin writing the words for what’s next and then add the photos in after – that way i’ll know exactly what i want – i hope. my friend tammy will be the lucky ‘photographer’. she also got to be the first to read the 3 chapters. once again, i wanted to have a picture in here. 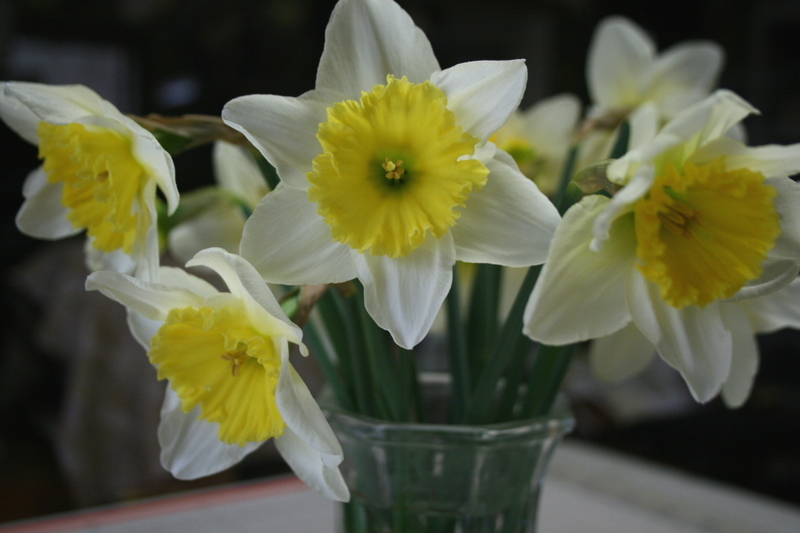 while i was looking at the daffodils i risked life and limb to cut(they bloom on the side of the very steep lower hill of our property) – i realized they are exactly like the fabrics i use for my ‘yellow’ daffodil kit – not the normal bright, solid yellow variety – these are bigger and more ‘open’ and the petals are creamy yellow and trumpets are brighter yellow. took a picture to share.